This is a very basic ribbed hat in several sizes. Join to knit in the round. Divide stitches between double pointed needles or needles for a magic loop. Divide with multiples of 12 on each needle. Which blanket? I will try if you can just let me know what blanket pattern you are seeking. i will be using a worsted weight yarn for this hat. the child is 5 years old. what modifications do i need to do? Use size 8 (5mm) needles and cast on 84. Good morning. I really would love to try this hat and will be using worsted weight yarn. The hat will be for a 1 year old. What size needles should I use and what number of stitches should I cast on? Thanks. Use size 8 needles (5mm) and cast on 72. I.love this hat but i find the stitches backwards when i start the crown. What am I doing wrong? When you start the decrease round your stitches on the row previous should be: k1, p2, k2, p2, k2, p2, etc. The ssk will be on a k and p making the k be on top. The k2tog will be on a p and k, making the k be on top. I want to make this hat for a 6 month old. I have size 7 needles. How many stiches should I cast on? Still cast on the 84 stitches. This is such a stretchy hat that it is very forgiving of slight changes. If I want to make this hat for a baby whose head measures 15 1/2 inches and I am using sport weight yarn with size five needles what number stitches would you cast on? Cast on 84. This is a very stretchy hat, so is fairly forgiving on exact size. Use size 10-1/2 needles (6.5mm) and cast on 48 stitches. I would like to make the hat without folding over the rim. How many inches should I knit up for the 6 month size before decreasing? Do you have a baby beanie pattern that is a 1×1 rib. It is made with worsted yarn and size 8 needles. Thank you so much for sharing this pattern! Can you tell me how many to cast on for a newborn size using worsted weight and size 6 needles? I’m just having to guess a bit about what gauge that would produce, but I’m guessing in-between 17 stitches per 4 inches (worsted on size 8) and 22 stitches per 4 inches (DK on size 6). I guessed 19 stitches per 4 inches, and with that adjustment, if you cast on as a preemie size, that will work out to be a newborn size. I love that you have such a great Q & A section! I am a new knitter and need to ask questions when I am trying something new. Going to start this hat today for soon to arrive g’baby. I love that it’s stretchy,so he may get more than one winter out of it. Great site! Hi! So I have a question. If I’m using size 8 needles and thicker yarn how many stitches do I do still? It’s for a newborn but I’m about halfway through with the needles and yarn I have and it’s HUGE? I just have to guess not knowing the gauge of your yarn. A typical gauge for yarn that would recommend size 8 needles would be 18 stitches per 4 inches. In that case, cast on 60. If your yarn has fewer stitches per 4 inches and what you have made seems like it is more than a couple of inches too big, then you can cast on 48. 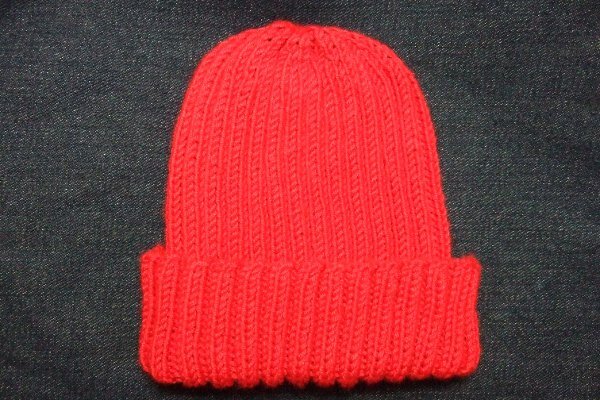 How do I decrease in k2p2 ribbed hat with 84 stiches? I knitted 5.5 inches. Should I decrease now. How? thanks in advance for responding so that I can finish my hat. I am knitted this hat with 4 needles. does this make a difference for decreasing. If you didn’t divide the stitches in groups of 12, you may have to move stitches around to combine them for the decreases, but that is the only issue. Then start the crown section. This will make the hat long for a good size border to flip up. Do you have any flat hat patterns to be done with long needles? I would love to make this for an adult lady. Use worsted weight yarn and a size 8 (5mm) needle and cast on 96. Thank you so much for the free pattern! My friend broke her foot, so I am going to make her a little “sock” to cover the bottom of her cast, as her feet are always cold. Your pattern is perfect. I have a problem with hats stretching out over time and becoming more like bowls. Which is more stretchy and holds its shape longer: K1P1 or K2P2? Is there a better yarn choice to help with this problem, such as one that is part synthetic? I usually know with pure wool. Thanks for your help. Synthetic yarns will be more apt to keep their shape than natural ones. K1P1 fits more snuggly, so will have to be stretched more to be worn, so I would think it would have more of a tendency to get stretched out of shape if the yarn has that tendency. I have seen some K2P2 that looked like a bowl, but I think that some knitters (especially less experienced ones) don’t keep the same tension with any ribbing that they do with stockinette. It might be a bit large. I’d say 108 cast on. Just found your blogs. Very cool. If you are not knitting in the round, you still decrease the same way. Usually you want to do the decrease rows on your right side rows. Want to knit the hat for a 1 year old but all in garter stitch, would I need fewer stitches? This is a very stretchy hat. My 8yo son is still wearing his toddler sized hat with this pattern. Hi, thank you for the pattern. I knit on the ‘ loose side’ I would like to make a hat for a year old. I’ m using dk and size 4 needles . Since I tend to knit big, how many stitches should I cast on? I think knitting with the smaller needles should help keep it the right size without adjusting the cast on. I always have trouble sizing hats b/c I knit too loose. I would like to make a 12 month baby hat or toddler hat. I’m using dk and US 4 needles. How many do I cast on in my case? I just made this hat for my son, it’s so beautiful! I want to make a matching one for my husband, who has a very large head and lots of curly hair. I’m using size 6 circular needles. How many stitches do you recommend I cast on? Thank you! Can you make this hat with two needles?? How would you do he decrease rows? Do the odd rows of the decrease on the front side. What does that mean? I too would rather use just 2 needles but don’t what you mean “Do the odd rows of the decrease on the front side” Can you rewrite the pattern for flat knitting? Cast on one extra than given in the in-the-round version. Repeat between the * for the row. Cut the yarn with several inches to work with. With a yarn needle, pull the yarn through all the remaining loops and secure. Sew seam, secure and weave in end. I’m sorry it took me so long to respond. I agree with that. I would like to knitt a matching baby and mother hat, what adjustments will I need to make for the mothers hat? Cast on 120 and knit the body to 9.5″. I’ve used your pattern several times, and it always turns out perfect! I’d like to make it for my grandson; his head measures 21”. I’m going to k1p1 for this hat. Using the same weight yarn as suggested in your pattern and size 6 circular needles, will it be enough to cast on 120 stitches? How many inches should I knit before decreasing? Thank you for your help and your time. If you want to do a k1p1 instead of a k2p2, I’d recommend another one of my patterns that goes up to larger sizes and has the k1p1 pattern. The problem with doing k1p1 with this pattern is that the crown reductions are made to work with the k2p2 pattern. If you use worsted weight yarn and size 8 (5mm) needles, the 96 cast on will make a small/med adult hat and the 108 cast on will make a large/xl adult hat. Sorry I don’t have any bootie patterns. If there is a basic bootie pattern you like, one with a ribbed top would coordinate. I think this pattern is wonderful for charity knitting but wish there was a pattern like this for flat knitting and also included an adult size. Hi there! This pattern looks great! I would like to knit a preemie size but my yarn is 4-medium weight. Could I use size 8 needles and go down to 48 stitches? Thanks! Yes, that should work well. Thank you! Came back to say that I had so much fun knitting this little cap! It’s my 1st full rib hat and I’m pretty pleased. Looking forward to trying your other patterns! I love this baby hat but I need to make it for 3 months withsize 3 US circular needles. How do I adjust? I also have size 10 US circular needles. Too big? Or could they also be adjusted and how would I do it? The hat is stretchy and pretty forgiving for fit. I think if you used the size 3 needles and made the 6 month size it would work out. Very nice pattern. Wanted to ask if the hat is a 2×2 rib because the instructions say k1, p2, k1 across. It is a a 2×2 rib. It’s k1, p2, k2, p2….k1. I have the round beg/end split one of the k2 fields to make the decreases work out later. See it now! Thank you very much. Makes sense! Hi, I have started a baby hat that is 1×1 ribbing in a classic mariner style. Do you have any general advice for how to decrease with ribbing for the crown? Thank you! I like to use a slip-2, knit 1, psso-2 type of reduction where the center stitch of the reduction is on a knit rib. This will make the stitches on either side seem to go under that center stitch.